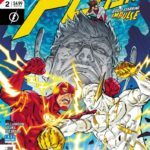 DC has posted five pages from this week’s Flash Annual #2, and you can see them at Comicsverse. In it, we see Bart Allen make an attempted triumphant return, and the sad fallout from the Heroes In Crisis series. Check it out at the link. This entry was posted in Flash News and tagged Annual, Flash Annual, previews on January 28, 2019 by Lia.